This tree shows that it has been coppiced twice making the large limbs from the original trunk about 4m up then these limbs were coppiced and grew straight up. This could be the case as we have evidence that looks like this in the rest of the wood. In the rest of the wood the trees are roughly the size of the largest limbs coming off the trunk of the giant tree, making it look like it was only coppiced once but the tree clusters show evidence of big trees as well. You may think that you are seeing a corpse in the roots. This photo could be of the primitive mummified man the hunter man that disappeared in Fortean Times magazine in 98. It fits the description of the scientists who time dated its woven hat and hunting knife proving this and then it disappearing when they went to retrieve the mummy with a team and they said its head was dislodged and nearby and its head wasn't coming out of the ice, presumably where these things are found. It was there the day I took this picture of the corpse, I recall, and thought it was like the Bodesea’s grave. Interestingly, to support this evidence, here are some tree clusters of wood that also looks like it's been coppiced once only and grown back. 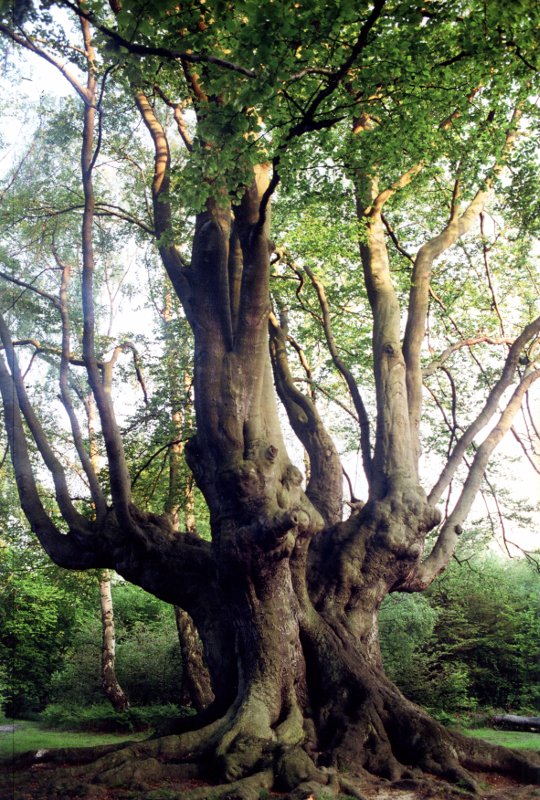 Furthermore, the clustered effect suggest large trees like the mother tree shown above may have been coppiced at ground level where the trunks have rotted away. Making trees only the size of the larger limbs of the giant tree with the original trunk still remaining. The mother tree then becomes a ‘time code’ of this coppicing process. This Tree Ring also suggests this process. This shows how it's all grown into the middle as opposed to the rim effect of the outer edge. These ancient earthworks have some trees on them that also look as if they have been coppiced once and grown back into big trees.